In this seminal addition to the wine canon, noted experts Rajat Parr and Jordan Mackay share everything they've learned in their decades of tasting wine. The result is the most in-depth study of the world's greatest wine regions ever published. There are books that describe the geography of wine regions. And there are books that describe the way basic wines and grapes should taste. But there are no books that describe the intricacies of the way wines from various subregions, soils, and appellations should taste. Now, for the first time ever, you can learn about the differences between wines from the 7 grand crus and 40 premier crus of Chablis, or the terroirs in Barolo, Champagne, and Bordeaux. Paying attention to styles, winemakers, soils, and the most cutting-edge of trends, this book explains how to understand the wines of the world not in the classical way, but in the modern way--appellation by appellation, soil by soil, technique by technique--making it an essential reference and instant classic. RAJAT PARR is the wine director of the 17-restaurant Mina Group, which includes properties in Las Vegas, Los Angeles, Miami, and Washington, DC. His program at the flagship restaurant in San Francisco holds a Wine Spectator Grand Award. He is also the cofounder of the wine labels Domaine de la Cote, Sandhi, and Evening Land Vineyards. JORDAN MACKAY is a James Beard Award-winning writer who lives in Napa Valley and travels extensively, speaking and writing about wine, spirits, and food. His work has appeared in Food & Wine, New York Times, Los Angeles Times, San Francisco Chronicle, Decanter, the Art of Eating, Wine & Spirits, and many others. He is the author of Passion for Pinot and coauthor of James Beard Award-winner Secrets of the Sommeliers (also with Rajat Parr), Two in the Kitchen (with Christie Dufault), New York Times bestseller Franklin Barbecue (with Aaron Franklin), and Knife (with John Tesar). "This is the sort of thought-provoking book that I will return to again and again." "This book is both the wine novice's and expert's dream, packed full of everything you need to know about the word's best wine. Rajat Parr and Jordan Mackay break down what makes each one special and unique, and what to look for when it comes to awakening your palate. All that's left to do is open a bottle you've never tried before and explore the possiblities." 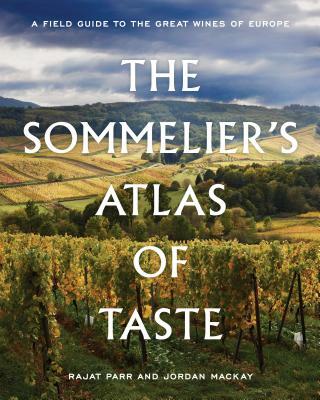 "The Sommelier's Atlas of Taste is an essential exploration of what makes the world's great regions, producers, and wines delicously compelling, and why. Rajat Parr and Jordan Mackay relentlessly examine geographical and geological differences, cultural shifts, and producer philosophies through the lens of taste. This book charts their glorious adventures, taking the reader with them into the cellars and vineyards of the most famous producers, and provides rare access and a best-of guide through thoughtful conversations and breathtaking photographs." "A fascinating voyage of wine discovery...Rajat Parr-an iconic sommeleir turned cult wine producer with an exceptional tasting ability and superb understanding of the major wine regions- and coauthor Jordan Mackay are well placed to discuss the complex topics of taste and terroir...A wonderful book that should be included in the book collections of any serious wine lover or wine professional." "It's a comprehensive book that's perfect for any oenophile--or anybody wanting to become one." "...a fascinating look at a world of after-hours tastings and tenacious debates, at the wines that many sommeliers care most about, and at restaurant service from an insider's view. We meet many unusual and charismatic personalities, not least of whom is Mr. Parr... in the tradition of the best sommeliers, useful lessons and tips are conveyed painlessly and entertainingly." "Parr and Jordan open a window onto the workings of a great sommeliers mind. . . .The result is part history lesson, part insider'sguide to the best producers and best buys, but, most of all, it's a testament to all the hard work that goes into being a greatsommelier." "If the key to understanding great wine is to drink it as often as possible, The Sommelier's Atlas of Taste comes in a close second. Rajat Parr and Jordan Mackay have jeroboams of experience when it comes to growing, selling, and deciphering the planet's most extraordinary bottles, and this book offers two things that others rarely include: genuine insight and good taste."